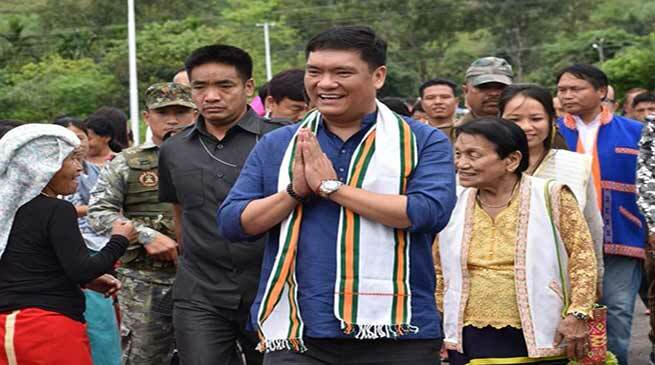 On his second day of visit to Lower Dibang Valley district, Arunachal Pradesh Chief Minister Pema Khandu today inspected the flood protection site at Patsing situated near the 14km point of state’s longest bridge over river Dibang. according to the officials here. The Chief Minister accompanied by WRD Parliamentary Secretary Gum Tayeng, administrative and department officials undertook a 30-minute jeep ride from national highway towards the riverbank to assess the damage of the nearby farmlands. Earlier the Chief Minister also drove along the 45-km Bomjir Paglam road and inspected the Sissiri River site that cuts through the road. The CM accompanied by department officials discussed on ways to improve the road. Later in his visit to the town, the CM inaugurated the BJP mandal office of the 42nd Dambuk constituency. The CM also laid the foundation stone for Govt Higher Secondary School, 100-bedded girls hostel and Baane Gidii Notko. This was followed by a brief presentation on proposal for construction of infrastructures for the festival ground for Orange festival. Addressing a public meeting, the Chief Minister appreciated the WRD Parliamentary Secretary for taking out timely measure in mitigating flood by constructing flood protection work at the Patsing site. He assured to fund the phase II of the flood protection work with further assurance to take up the project with the Govt of India in composite way. On Bomjir-Paglam road, the CM assured to take up the project with the Union Ministry of Road Transport & Highways to be taken up under highway project. He, however, suggested the public that compensation demand should not become hurdle in completion of the project. He said the road is of vital importance as it can change the economic scenario of the area. The Chief Minister also assured to expedite the works for highway from zero point to Sissar along the Dambuk-Pasighat highway. He informed that land compensation matter is completed and contractors will be asked to carry out work as soon as possible. On demand for stationing of paramilitary force in Dambuk area to check intrusion of anti-social elements from neighboring state, the CM assured to hold talks with state DGP for stationing of state police battalion. He further informed that state government is taking all measures to strengthen law and order in the state. To strengthen the civil police department, the CM informed that state government is creating more than 1000 posts under various categories. Also a permanent high court in the state will be established soon, he informed. State BJP President, Agriculture Minister Dr Mohesh Chai, Gum Tayeng, Roing Deputy Commissioner Mitali Namchoom also spoke on the occasion.